Tourists going to Thailand have an impressive choice of amazing beaches and islands to chose from, Phuketwith its convenient connections through Abu Dhabi and Dubai, Ko Samui, Phi Phi, the drivable (from Bangkok) Pattaya. The favourite visitor spot for the Thai people themselves is far from a beach and just as beautiful. 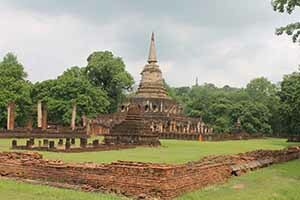 Sukhothai was heart of an empire from 1238 until 1438, the time of Thomas Aquinas and the building of Trim Castle. 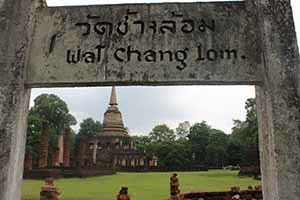 Sukhothai was heart of an empire from 1238 until 1438, the time of Thomas Aquinas and the building of Trim Castle. It is not as famous as Nagkor Wat but equally beautiful. 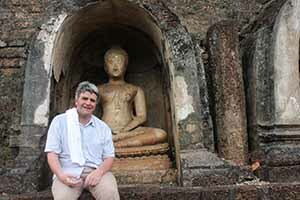 It was hot and sticky when we mount our bicycles to tour the Thai medieval capital of Sukhothei. Even more beautiful that Sukhothei is Si Satchanalai. It is quieter, calmer and goes on for miles. 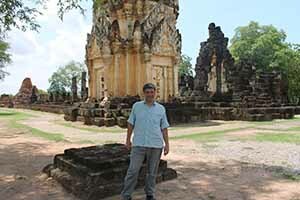 The ancient temples are surrounded by forest, redolent of more famous ruins in adjoining countries. It may be the most impressive of the deserted cities I have seen, ahead of Angkor Thom, Angkor Wat or even Fatehpur Sikri, doomed by their popularity in the tourist charts. Sumptuous meets simplicity in the temples here, the type constructed by ard-nósach emperors everywhere, but so close to the forest so as not get carried away with delusions of grandeur. IN a recent pool by one of the Bangkok newspapers, the people of Thailand were asked to select their own favourite heritage attraction. A similar poll in Ireland picked Newgrange. They picked Si Satchanalai. Kanarat Nettip and Ekkorn Suwannetr tell us the story of the fall from glory that is Si Satchanalai. It is not something I imagined I would ever do. I am used to travelling in style and style doesn’t come with bigger horns that the water buffalo called Sam. 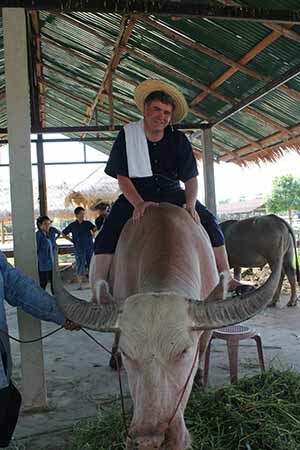 Sitting astride a water buffalo is not on many bucket lists but this is part of a farm visit to Dr Prasert’s Organic Agriculture Project. It comes straight from the menu of experiential tourism that everyone is promoting nowadays. 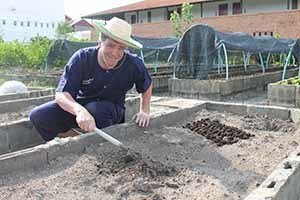 The farm visit by a group of tour operators and myself is more of a hindrance than a help to the productivity of Thailand, but tourists love it and keep coming back for more. 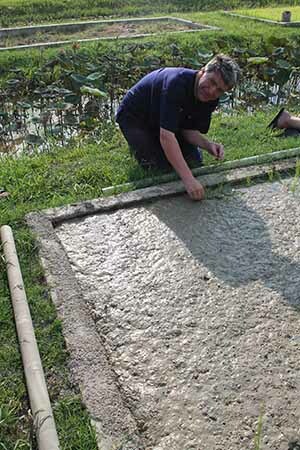 A Paddy abroad, as a 1970s English comedian might put it, my merciless taskmasters set me to planting rice in the paddy fields. I lasted all of, maybe, twelve minutes. 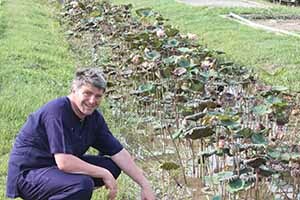 My rice planting was disastrous. South East Asia would starve if they were relying on my rice. She outlined the country’s emphasis on green, golf, wedding and honeymoon and health and wellness to grow further its market share from Ireland. Green is good. It is astonishing how green the country is as you flight north from to Suvarnabhumi, airport to the picture postcard airport that serves the region. 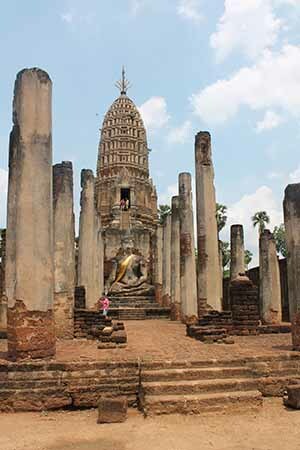 The ruins are an hour’s flight north of Bangkok and offer an intriguing glimpse into South East Asia’s grandeur before the Europeans came. The perspiration rolls off us we cycle. Humidity hangs heavy in the air. The pool in the Sukhothei Heritage Hotel is tepid, like a warm bath, even early in the morning. The rooms are villa like, built around a succession of courtyard pools. The architecture borrows heavily from the local traditions as well as western hospitality convention. We swim in that enclosed pool a thunderstorm, lightning flashing like a laser show around us. That swim was an experience not easily forgotten. An early morning flight brought us back to Bangkok to the Pathumwan princess hotel, conveniently beside the MBK shopping mall. It has a magnificent salt water pool on the eighth floor, and a poolside Italian restaurant where we breakfast on kai jiew khun chai. Chic and stunning, the W Hotel is Bangkok’s latest opening. They have a 24-hour pool and a throbbing lobby bar with a DJ. When our genial host Wi drops us to Suvarnabhumi, airport to check in on flight EY401 to connect with EY045. The journey is 5 hours 37 minutes Bangkok to Abu Dhabi and 6 hours 19 minutes from Abu Dhabi to Dublin with a very pleasant two hour stopover in the business lounge. Somebody in the west of Ireland once said Thailand would be a great place if it was closer. It is getting closer every day. Eoghan Corry flew to Bangkok with Etihad who fly ten times weekly from Dublin to Abu Dhabi with onward connections to Bangkok and Phuket as well as 88 other destinations worldwide. See www.etihad.com/en-ie or your local travel agent.